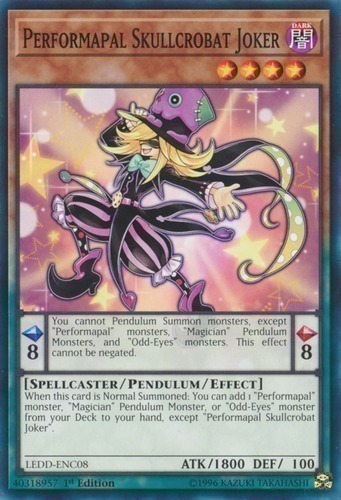 Text Pendulum Effect: You cannot Pendulum Summon monsters, except "Performapal" monsters, "Magician" Pendulum Monsters, and "Odd-Eyes" monsters. This effect cannot be negated. Monster Effect: When this card is Normal Summoned: You can add 1 "Performapal" monster, "Magician" Pendulum Monster, or "Odd-Eyes" monster from your Deck to your hand, except "Performapal Skullcrobat Joker".